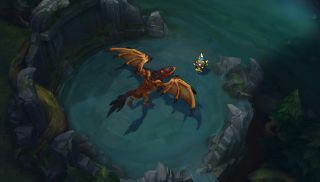 Summoner's Rift is League of Legends' version of the classic three-laned DotA map. Naturally, it's the game's most popular playing field, and, as a result, any changes to it are a big deal. And so, this: a video tour of what Riot are doing with a new version of the map, currently in testing on the game's Public Beta Environment. It's a big overhaul—designed to make the game feel less cluttered, and its systems more readable. It's also not being rushed. None of the currently implemented features are complete, and, as the video states, there are "months of effort ahead". Those interested in offering feedback are encouraged to participate in the PBE, and to visit Riot's new ' Rift Hub '. There they'll be posting development updates and news of the latest changes.